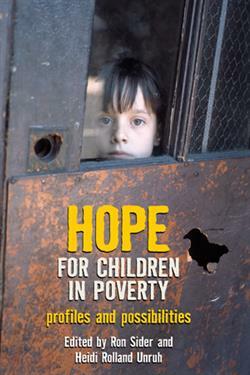 10% of the proceeds from sales of Hope for Children in Poverty will go to the Children in Poverty initiative, American Baptist Home Mission Societies. Editors Ron Sider and Heidi Unruh have drawn together the expertise of academics, activists, pastors, and social service professionals to consider the lives and special concerns of children living in povertybiblically, educationally, physically, sociologically, politically. This comprehensive reader does more than just analyze the problems. It takes a giant step forward in exploring real solutions through public policy and faith-based organizations. Read the words of the children themselves in interviews, profiles, and poetry. And learn from those who are already making a difference in the lives of poor and low-income children. "This is the book I have been waiting for somebody to publish for years." Heidi Rolland Unruh has researched and written extensively about church-based community ministry, including co-authoring the books Churches That Make a Difference and Savoring Souls, Serving Society. As director of the Congregations, Community Outreach and Leadership Development Project affiliated with the Evangelicals for Social Action, she serves as a trainer and consultant on faith-based community development. Ronald J. Sider is professor of theology, holistic ministry, and public policy as well as director of the Sider Center on Ministry and Public Policy at Palmer Theological Seminary. A widely known speaker and writer, Dr. Sider is also president of Evangelicals for Social Action, publisher of PRISM magazine, and a contributing editor to Christianity Today and Sojourners magazines. His Rich Christians in an Age of Hunger was recognized by Christianity Today as one of the one hundred most influential religious books of the twentieth century.